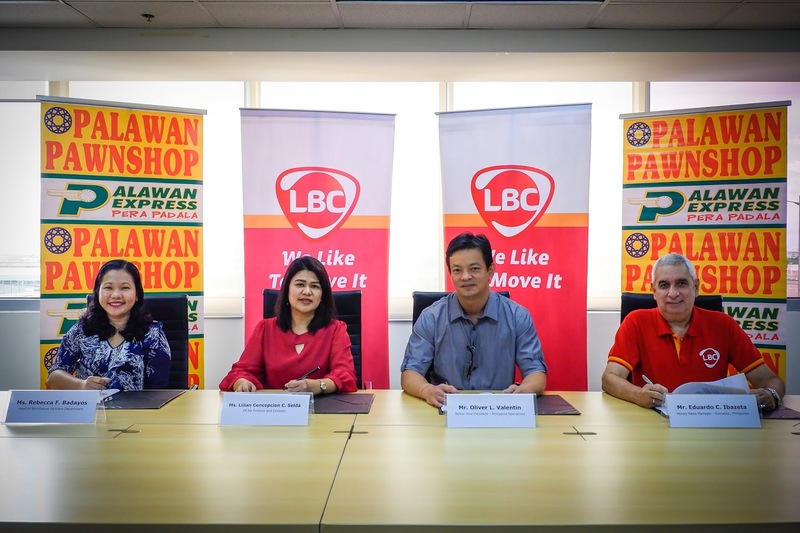 LBC EXPRESS and PALAWAN EXPRESS PADALA (PEPP), two of the leading names in money remittance have forged an alliance that will enable their customers to make sending and claiming money easier and more convenient. This comes after both parties signed a memorandum of agreement recently at the LBC headquarters in Pasay City that signaled the official re-launch of their partnership endeavored to benefit their legions of customers nationwide. The historic occasion was attended by (from L-R): Lilian Concepcion C. Selda - VP for Finance and Controls, PALAWAN EXPRESS; Rebecca F. Badayos - Head of Remittance Partners Department, , PALAWAN EXPRESS; OLIVER L. VALENTIN- SVP, Philippine Branch Operations, LBC Express Inc.; and, Eduardo C. Ibazeta- Money Sales Manager, LBC Express Inc.
Valentin says: “The need for a reliable and efficient money remittance platform has increased exponentially. And we, at LBC are happy that with this renewed tie-up with Palawan Express, we are able to reach both our loyal and new customers alike. By combining our strength, we ensure that more Filipinos will be able to send and receive remittances wherever they may be. LBC is the Philippines’ market leader in retail and corporate courier &amp; cargo, money remittance, and logistics services. With a growing network of over 6,400 branches, hubs &amp; warehouses, partners, and agents in over 30 countries, LBC is committed to moving lives, businesses, and communities and delivering smiles around the world. Listed in the Philippine Stock Exchange through LBC Express Holdings, Inc., LBC aims to deliver value to all of its stakeholders, as it has for over 60 years. Founded in 1945 as a brokerage and air cargo agent, LBC pioneered time-sensitive cargo delivery and 24-hour door-to- door delivery in the Philippines. Today, it is the most trusted logistics brand of the Global Filipino. LBC can move it for you: visit www.LBCexpress.com, or call telephone +632 8585 999 (Metro Manila), 1 800 10 8585 999 (Provincial), +632 9086 522 (Solutions) and follow LBCExpress (Facebook and Twitter).